For millennia, desert nomads made their way across stark, sun-scorched stretches, traveling between destinations with stops only at cool, glittering oases, where they could rest and find respite from their grueling work. There are only a few nomads in the Mojave these days, and there is a good chance that if you are reading this article, you aren’t one of them. However, the blazing sun and torrid heat of Las Vegas isn’t any kinder to you just because you’ve settled in one spot. You need an oasis as much as anyone who has ever lived and worked in the desert. Start with a patio cover. Patio furniture is important, but the first ingredient in your oasis has to be shade. It’s great to get outside and get some fresh air, but you need to be able to get out of the oppressive sun in order to stay cool. 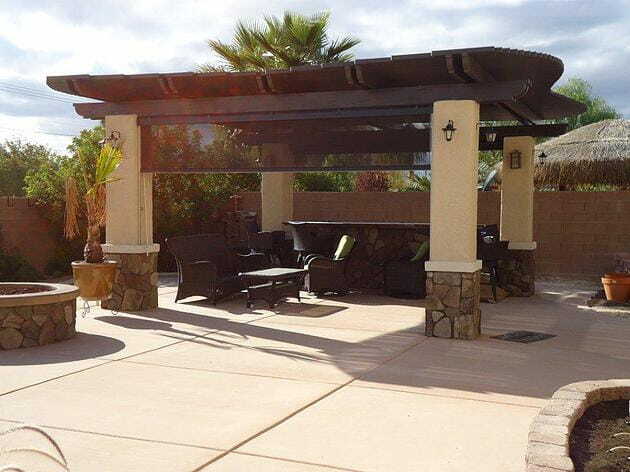 Whether it’s a lattice or solid cover attached to your house or a free standing piece, Proficient Patios will work with you to find what patio cover works best for your vision. Check out our fixed selection here and our adjustable patio cover selection here. Re imagine your landscape. Proficient Patios doesn’t just provide patio furniture and decoration – we can help you totally re imagine your backyard. Whether you want trees and bushes, a lawn, a hardscape made of stone and concrete or fire and water features, our experts can help make your dream patio a reality. You can learn more here. Add a spa. There is nothing as relaxing as coming home from a long day at work and hopping in the hot tub. Spas are also a great addition to parties and get-togethers. We have one of the largest selections of spas you’ll find in Las Vegas, with brand names you trust, like Clearwater Spas and CalSpas. Check out our lineup here. Get a world-class barbecue. No backyard oasis is complete without the ability to fire up the grill and feed your family, friends and loved ones. We have a variety of barbecues available that can fit any theme or décor. Browse our styles here. Finish it off with the best patio furniture in Las Vegas. Now, it’s time to bring it all together. We have patio furniture to suit any Las Vegas backyard – full stop. With a wide variety of materials, styles, aesthetics and products from brands like Corradi, no matter what you are envisioning in terms of patio furniture, we can help to pull it all together. You can peruse our collection here. Desert dwellers have known how to take a break in style for thousands of years. Isn’t it time you followed in that grand tradition and built an oasis of your own? Come visit our 25,000 square foot showroom or contact us today.